Here is the most important truth about the cross every Christian has been called to bear: It is not a cross of your own making; God has assigned it to you! The audience our Lord was speaking to knew well what this meant. In the Roman Empire, a condemned criminal or captive was forced to carry the beam of his own cross to the place of execution. Jews and Gentiles alike had witnessed this ghastly scene countless times as condemned men dragged their crosses through the streets of the city. The Christian cross is not a choice; it has been prepared by our Prince, and we are to take it up as a badge of honor—not a burden of horror. Each day we are commanded by Christ to submit our shoulder to that beautiful beam, which is designed to crucify the self and exalt our Savior. Jesus led the way in cross-bearing for every Christian to follow. “Christ suffered for you,” the Scriptures explain, “leaving you an example, that you should follow in his steps” (1 Peter 2:21). What better way to identify with our Captain than to carry our own cross on the way to glory? Make no mistake; as it was then, it is also today. 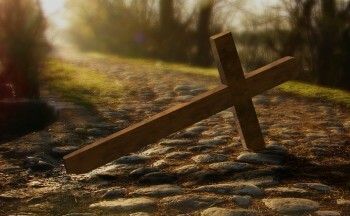 The Via Crucis [Latin for the Way of the Cross] is the way of safety and security because our Savior has gone before us. We need not fear nor faint as we tread its thorny paths, because they lead us to our Lord. As we have surrendered to Christ, we must surrender to our cross, bearing its burden by the power of the Holy Spirit. As we follow the Crucified One, we too must be crucified as God conforms us into the image and likeness of Christ. So . . . do you accept the calling of your cross today? Divine will says it is for God’s glory and your good. Let those two truths strengthen you under the weight of your cross as you make your way, by God’s grace, to the Celestial City where the One who carried the cross before you waits to greet you with open arms and nail-scarred hands. Gotta Admit, there are times (too often to number) when the idea of me looking anything like the image of Christ is so far off in the distance as to discourage and paralyze me. However, then there are those little moments I am blessed with where something good springs forth from me and I know intuitively that it was solely (100%) Christ in me which brought it forth. The message Sunday about community rings loud in my ears today. What merit is there to remember the chains that bound me when, through the ugliness and glory of Golgotha, they are no more?. We are free to commune directly with Him. He invites us freely to speak to an audience of one and He captivated, glorified and delighted when we become His hands and feet. So simple, yet we allow the grey matter between the ears to complicate things (at least I do). Tune in, Turn to Him, Take up Your Cross, Serve. Got Jesus?